It seemed that no matter how vibrant and energetic Sidi Touré and his band were, the crowd at his mid-afternoon set were bound to their seats. Immersed as he is within the often upbeat style of Songhai music, the gifted Malian singer and musician led an astounding ensemble through an immensely danceable and groove-oriented batch of songs. 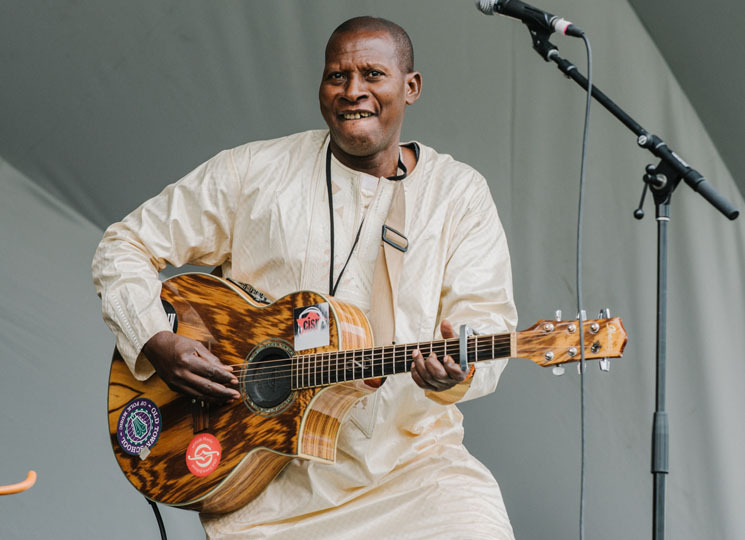 An electro-acoustic exhibition, the core rock band instrumentation (slithering guitar lines, bouncy bass, and steady drums that exploded in sudden blasts) was augmented by subtle n'goni, a traditional Malian acoustic guitar, and both solo and group vocals. Music of such a high order deserved more than filled lawn chairs, which were only really emptied when their occupants inexplicably saw fit to wander elsewhere on site. Look, Canadian folk festival audience dancing is seldom something anyone should encourage, let alone long for, but in the case of a Sidi Touré performance, it's patently offensive not to get up, send some of his vibes back at him and move something. Kudos to the small clusters of attendees who did.